Sunset Lodge - St Lucia Accommodation. Sunset Lodge is situated on the banks of the spectacular Lake St Lucia, a World Heritage Site. We are self catering luxury log cabins with air conditioning. We have 4 chalets that sleeps four people, 1 five sleeper and 1 two sleeper. There is a microwave, fridge with freezer, kettle, toaster and hob in each chalet. There is one bathroom in each cabin, with a basin, toilet, bath with a shower in it. There is SABC 1, 2, 3, e-TV and M-Net. Bath towels are supplied, but you need to bring your own beach towels. They are non smoking chalets. 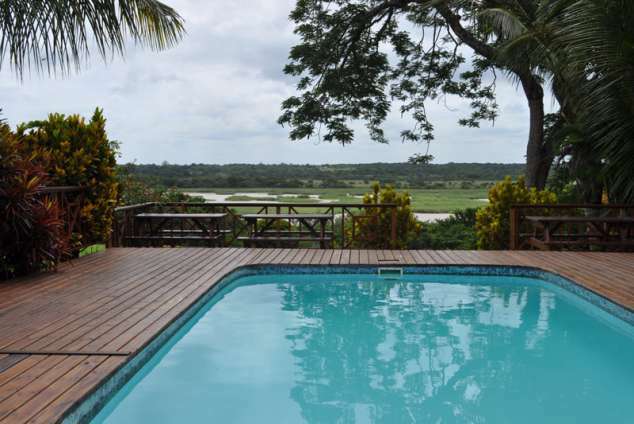 Each chalet has there own private deck, there is a huge big bond fire the front overlooking the estuary, or your own portable braai which you can use right outside your chalet. You can see the estuary from your chalet. We have hammocks hanging in the tree where you can relax and unwind reading a book. We are in walking distance to all the shop and restaurants. We can organise you any trips to the game reserve or cape videl, hippo and croc tours on the estuary. Whale watching, night drives, deep sea fishing charters, horse riding, turtle tours, and so much more. 81224 page views since 24 Mar, 2006.